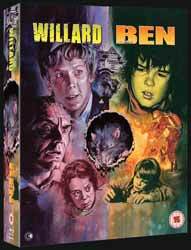 I have seen the film Ben before, but I don’t remember having viewed its predecessor Willard. This one (based on Ratman’s Notebooks, by Stephen Gilbert) is by far the superior of the two. Bruce Davison, who was known in the film industry after this as the ‘Weird Rat Boy’, very competently draws the viewer in with his sympathetic but determined Willard. Sondra Locke is the not-quite love interest, and Ernest Borgnine is delightfully hateful as Martin. Cleaned-up with a new 4K scan and displayed on Blu-ray this film looks remarkably good. It doesn’t seem that dated even though it hails from 1971. Extras for include a commentary by Bruce Davison, an interview with Bruce Davison, a trailer and stills gallery. Aside from the relationship between the boy (who is brilliant) and his sister, everything else seems to be built on set pieces, such as the wrecked food market and the implied cheese shop. It’s certainly not a bad film but, compared with Willard, it falls far by the wayside. There is an HD transfer and restoration, but it still looks pretty grainy and somewhat dark in some scenes. Every time there is an incident in this pic the local rubberneckers stand completely statuesque and staring. It reminded me of Ray Bradbury’s short story The Crowd. Extras include a commentary by Bruce Davison, an interview with Bruce Davison, a trailer and stills gallery. For Ben we have a commentary by Lee Montgomery, an interview with Lee Montgomery, trailer for this film and another promoting this double feature, and a stills gallery. There is also exclusive new cover artwork by Graham Humphreys. I think Willard deserves a 9 and Ben a 7, so I’m going down the middle on this one.